Florida schools will begin administering the FSA on Monday, March 2… The pressure is on to assure the data is collected at all costs. FSA Question and Answer Guide. In the absence of the “whole truth” from the DOE, this clarification has been needed to quell the confusion and fear-mongering that was so cunningly targeted at parents and teachers. Seminole County’s Guide was the first bit of truth to come out of any district since the commissioner issued her chilling letter. Parents across the state have been asking the same of their districts. So far, only Brevard, Hillsborough, Lee, and Polk Counties have joined Seminole County in similarly supporting children and families statewide. We are grateful for this demonstration of true leadership. On Friday, Supt. Jenkins underscored the district’s position by sending this e-mail to parents. But that was not enough. The message also went out as a robo-call and in text messages, all in the space of an hour. Supt. Jenkins is Florida’s 2013 District Data Leader of the Year. Her message is clear. We want the data… and we will have it. As a parent, I am embarrassed and ashamed that these statements represent my school district. What greater “undue burden” has any parent placed on our children, as young as eight years old, than the state’s burden of excessive high-stakes testing to harvest data, to secure school funding, and to threaten job security for teachers? THESE ISSUES are the real adult issues. The mandates, policies, rules, and statutes attaching the highest stakes to testing have already been forced upon the backs of our children by punitive federal and state laws, and are implemented and enforced by school districts. The Superintendent is correct when she states that there is no option to opt out of the FSA. Opting Out has never been an option, and it is still not an “option”. No parent or student is asking for permission to opt out of the test. It has always been a parent’s and a student’s RIGHT to do so. Parents and students can still make that choice, regardless of the Commissioner’s letter. What can you do to protect your child from having to bear such a burden? Your parental mandate to protect the well-being of your child morally supersedes any law of the land to provide “accountability” to the powers that be. You can refuse to go along without question simply because it is mandated. When parents make the decision for their child to opt out, some express fear or hesitation, others tell us they have been repudiated, over placing the burden of opting out on young children, such as Supt. Jenkins implies repeatedly. The daily burden of excessive, punitive high stakes tests on children is a far greater burden for them to bear than refusing the test will ever be. This burden is not imposed by parents. Children are really on the front lines for matters that have nothing to do with their actual learning. They are there at the behest of the state, NOT parents. And you do not have to offer them up like little lambs. When children, especially young children, are asked to bear the burden of performing on a single test, or else… in order to ensure their promotion, graduation, possible retention and/or remediation, whether their teacher’s contract is renewed, whether their school stays open, whether their school gets the right grade to ensure adequate funding, it is oppressive and abusive. There is no way that it cannot be. THESE are adult concerns and have no place in any child’s education. To allow children to participate in this farce is to condone and perpetuate these oppressive and abusive policies. High stakes testing distorts the relationship of trust between teachers and students. Is the business of our school districts and schools to support our children in learning to love learning so that they can become curious, questioning, independent, engaged, productive and contributing citizens – in other words, whole human beings? Or is the state’s chief concern the implementation of state mandates, no matter the human cost? Some have expressed concern that students who opt out harm their teachers and schools by denying test scores and data. Proper refusals do NOT count against teachers and schools. Furthermore, THIS is the very reason why we MUST refuse by opting out: we do not send our children to school for the purpose of providing data, with which to protect their teachers and schools. THIS is adult business. Opting out is not easy. It is not an action parents choose without great consideration of all of the consequences. It is our last resort, in order to bring to bear the appropriate pressure on legislators to effect positive, meaningful, and lasting change to the laws governing public education. 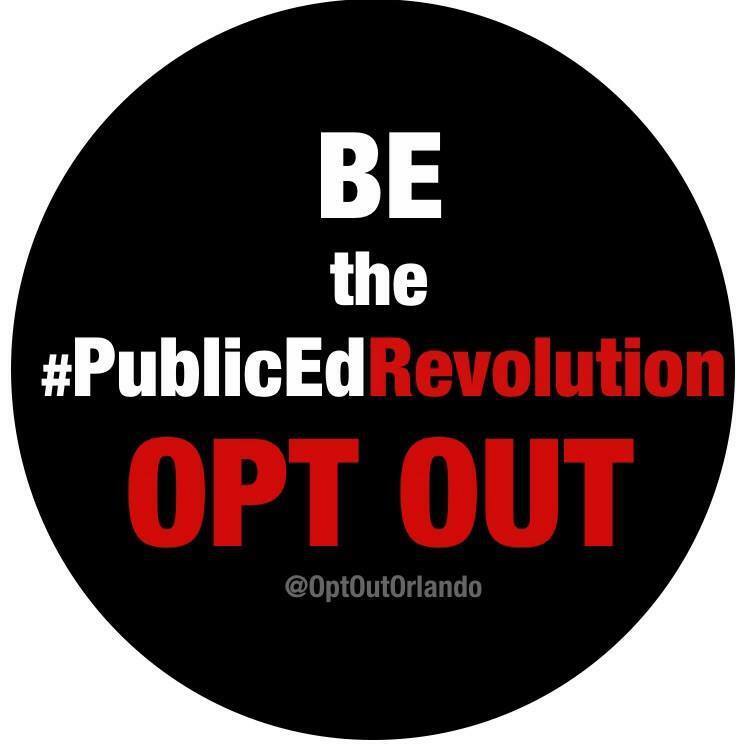 Since last June, Opt Out Orlando has helped parents, teachers and former teachers to start their own local Opt Out groups in 26 separate districts across the state of Florida. In this way, parents and teachers have locked arms and have become empowered to address their specific concerns and to advocate for the children in their local communities. We also advocate strongly for teachers. And we have organized thousands of parents and teachers, who work tirelessly in support of meaningful legislation, with which we hope to return authentic assessments and real accountability to public education in Florida. It is our hope that as Monday looms large, that the Department of Education will provide guidance to all districts, with which to respectfully deal with families who choose to refuse these tests on moral grounds. If school districts continue to put the admittedly unreasonable and illegitimate demands of the state above the welfare of our children, this grassroots movement will continue to grow. Since Supt. Jenkins’ campaign of intimidation yesterday, we have been VERY busy approving all the new parents requesting to join Opt Out Orlando. Until we have multiple measures of authentic assessments to guide our children’s education, that do not threaten and punish children, teachers and schools, we will continue to refuse these high stakes tests, and we will continue to grow this movement. NOTE: It is important to note here that although Polk County has issued virtually the same policy for children and testing and test refusals as Seminole County, they have sent the most threatening directive to teachers – threatening them for not reporting POTENTIAL opt outs, of which they may be aware. This is blatant intimidation and it is unconscionable.